Jeff Scherb is said to be something of a legend in the Jeep community. If the rest of his work's beautiful as this Land Rover-style "Safari Cab" roof for the JK Wrangler, I'd say his good reputation is well deserved. Scherb's cab conversion puts a slant in the Wrangler roof right over the front doors affording a little more interior volume. Alpine windows in the back bring in more light and visibility, as do extra glass in the rear pillars. It's basically a Land Rover Defender aesthetic conversion for current-body style two and four-door Jeep Wranglers. And so far, it looks good enough to make me stop pining for an overpriced English import. Because it's modular, the side panels can be removed and replaced with roll-up soft sides, while leaving the roof in place. The prototype side windows include kick-out vents to provide some ventilation for the rear. The design also includes integrated roof rack mounts that support the load on the rack to the sport bars, so it will support heavy loads up top and doesn't require an "exocage" style rack. 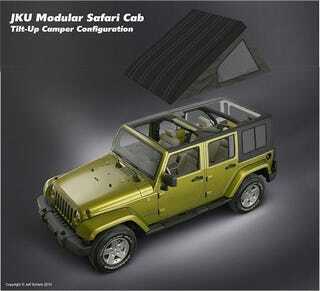 The modular nature would give Jeep owners even more flexibility in open-air options than the factory top provides. Scherb's already executed this type of roof on an LJ Wrangler (long-wheelbase TJ), and it looks sharp in the field. He's also got some insanely cool trailers, pickup conversions, and a camper top. Cruising through the whole JK-Forums thread is like flipping through the ultimate adventure-Jeep builder's dream catalog. JK-Forums moderator Detroit Steel says Scherb won't sell this part (or any other) himself, but "develops concepts to be licensed to other companies for production." 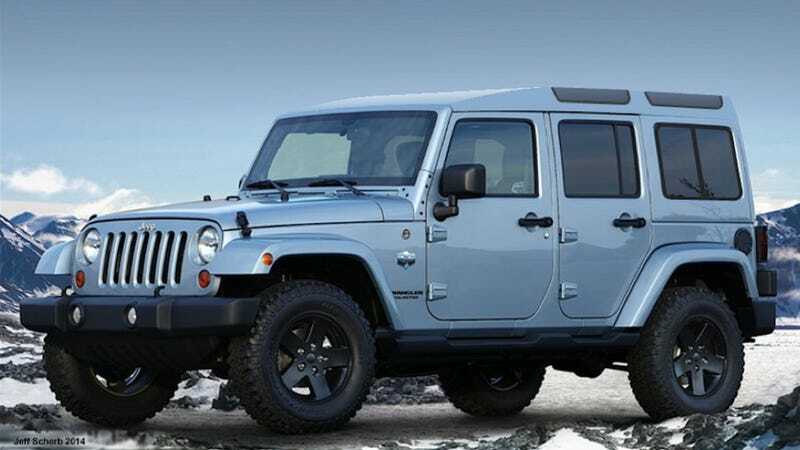 So here's to hoping one of the hundred Jeep shops grabs this and starts mass-producing it!